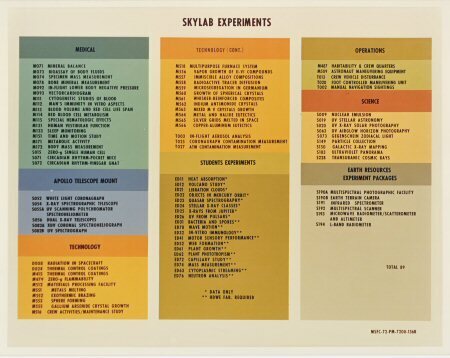 This is the Official emblem for the NASA Skylab program. 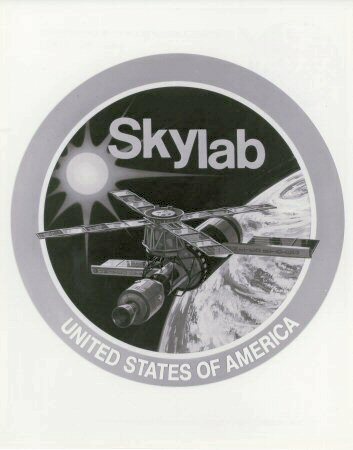 The emblem depicts the United States Skylab space station cluster in Earth orbit with the Sun in the background. 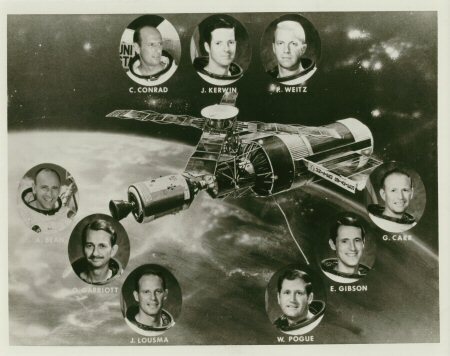 An artist's concept of a completely deployed cluster of the Skylab components in earth orbit framed by portraits of the nine prime crewmen chosen for the program. This fine vintage NASA colour photograph is in near mint condition. This fine vintage NASA Photograph is in very good condition. 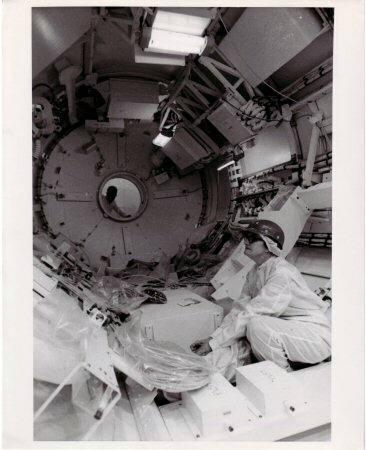 This fine vintage NASA Photograph is in very good condition, near mint. 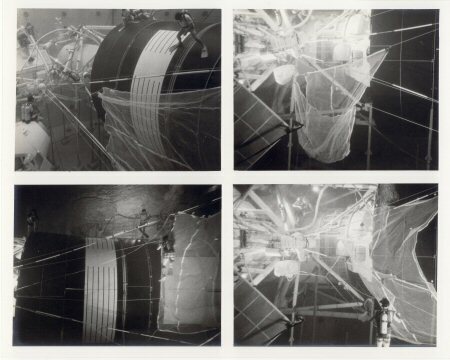 One of the few NASA black and white photographs printed on 'A Kodak Paper'. 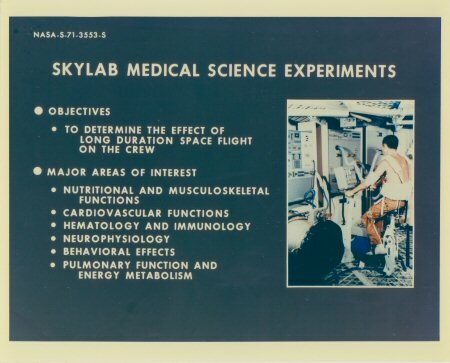 Skylab Program Concept Of Major Mission Activities. 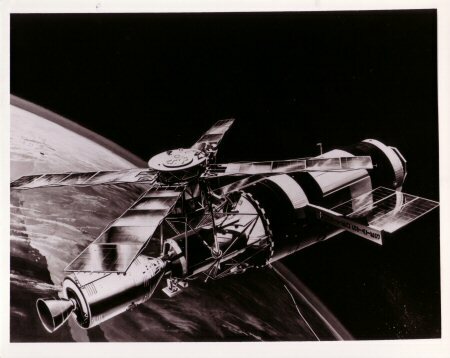 Here is a brilliant NASA concept of Skylab. 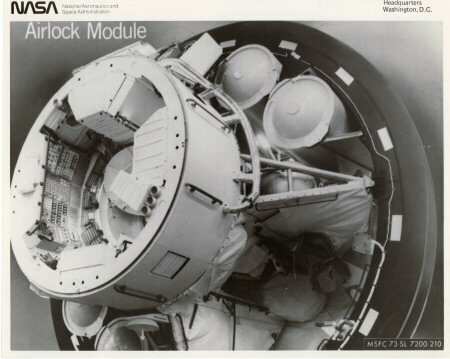 The cluster is composed of the Apollo Command/Service Module, Orbital Workshop, Apollo Telescope Mount (ATM), Multiple Docking Adapter, and Airlock Module. 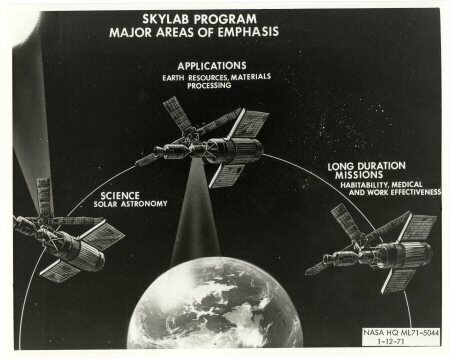 A Martin Marietta artist's concept of the Skylab space station cluster in Earth's orbit. 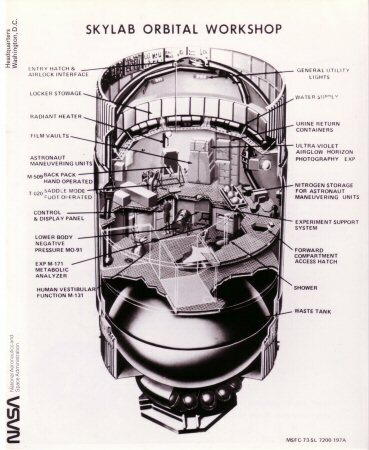 The cluster is composed of the Apollo Command/Service Module, Orbital Workshop, Apollo Telescope Mount (ATM), Multiple Docking Adapter, and Airlock Module. In this concept, a member of the three-man astronaut crew is working atop the ATM in the zero gravity of space. Note the arrays of solar cell panels which turn sunlight into electric power for the space station. A very detailed cut-away of the Manned Orbital Scientific Space Station. The detail descriptions is very fine print and can easily be read. 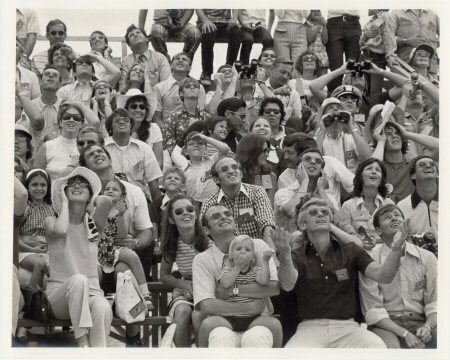 This very fine 1975 vintage NASA glossy photograph is in near mint condition. Printed using the same paper and process as the 1973 prints. 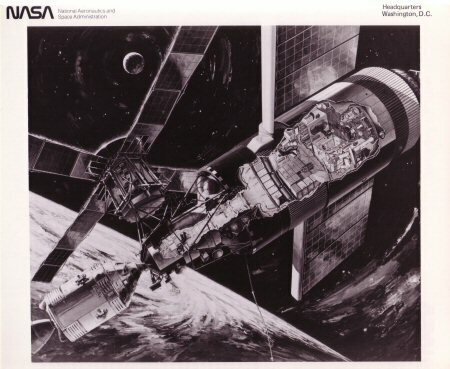 An artist's concept illustrating a cutaway view of the Skylab 1 Orbital Workshop (OWS). 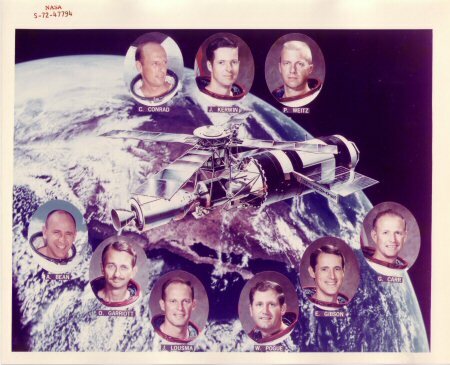 The OWS is one of the five major components of the Skylab 1 space station cluster which was launched by a Saturn V on May 14, 1973 into Earth orbit. A very brilliant cut-away illustration of the Manned Orbital Scientific Space Station. 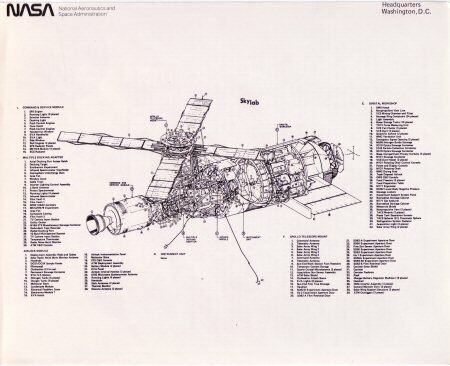 The cluster is composed of the Apollo Command & Service Module, Orbital Workshop, Apollo Telescope Mount (ATM), Multiple Docking Adapter, and Airlock Module. 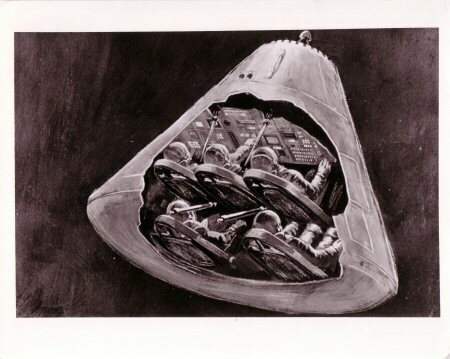 An artist's concept with cutaway showing a rescue vehicle for Skylab missions. 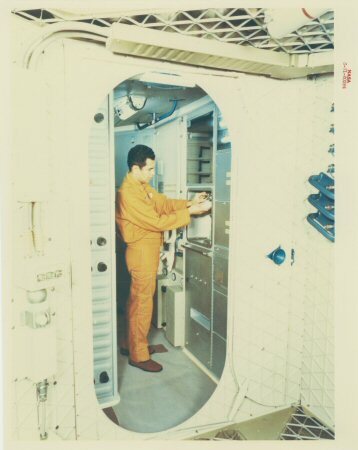 The modified Command Module is designed to accommodate three rescued Skylab team members and the two-man RV crew. 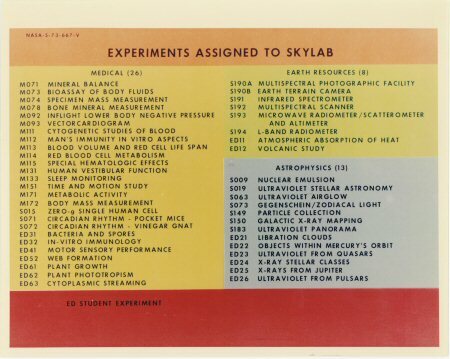 A fine presentation photograph showing all the major units that make up the Skylab Space Station. 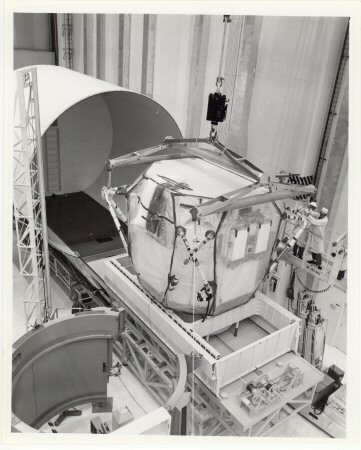 The Orbital Workshop is seen in the far left pane with the Multiple Docking Adapter and Airlock in the centre and finally the Apollo Telescope Mount seen in the far right. 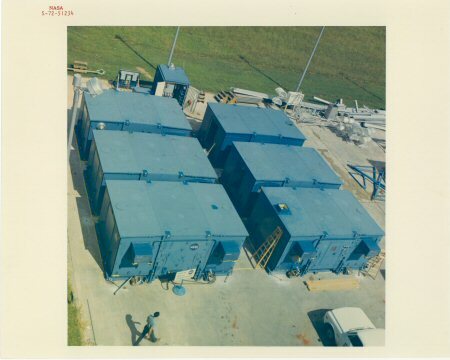 These Mock-up units are use for pre-flight training as they are full scale duplicates of the actual flight ariticles. This very fine vintage colour glossy NASA photograph is in very good condition. Printed on heavy "A Kodak Paper". 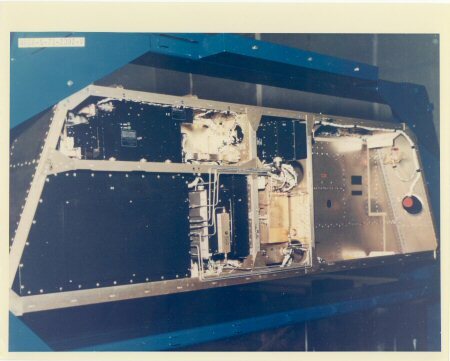 External View of the Multiple Docking Adapter (MDA) for A Crew Station Review (CSR) showing the Command Service Module Docking Port and the EREP S194.S-Band Antenna in foreground. 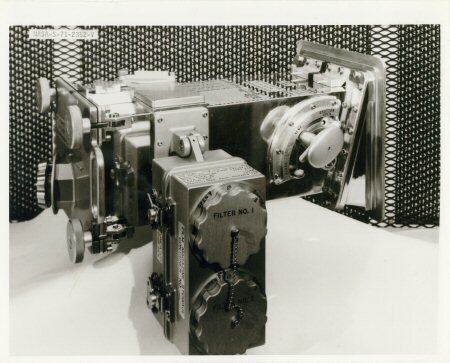 Also seen is the S191 IR Spectrometer experiment packages, S190 window cover, and the S192 Ten-Band Multispectral Scanner package in the background. This very fine vintage colour glossy NASA photograph is in near mint condition. Printed on heavy "A Kodak Paper". Seen is the other end of the Multiple Docking Adapter (MDA) Mock-up from Airlock Module interface. Shows externally mounted EREP experiment package. S192 is in the foreground, S190 experiment is in the background with the S194 S-Band Antenna at the far end. 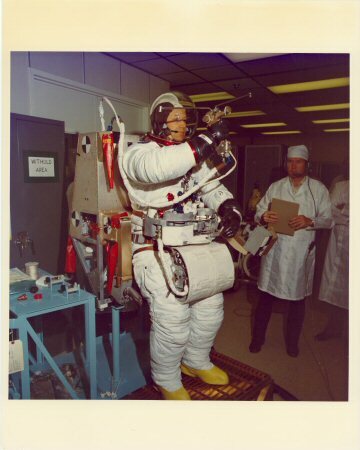 A test subject wearing a pressurized space suit moves along the parallel hand rails toward the sun end of the Apollo Telescope Mount mockup under simulated weightless condition. The mockup is submerged in a crystal clear water in the giant Neutral Buoyancy Simulator tank at the Marshall Space Flight Center. 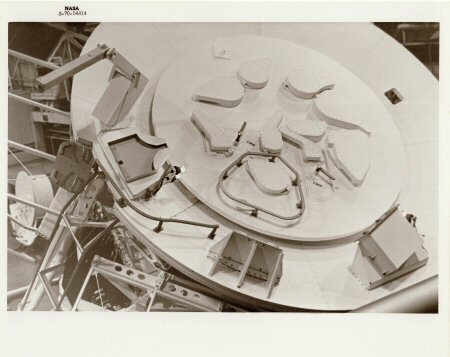 Mockups of the ATM and the other various components of the Skylab Cluster are submerged here for human factors engineering work that is being conducted in preparation for the first manned mission to the Skylab Space Station. 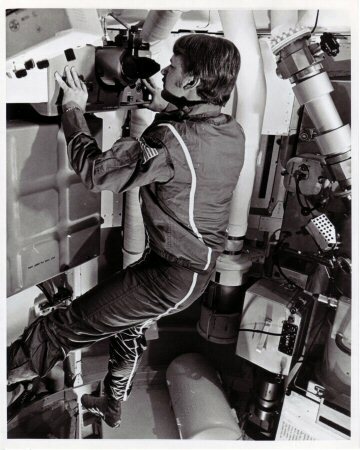 Engineers simulate Skylab astronaut actions in a full-scale training model of the experimental space station's Multiple Docking Adapter. 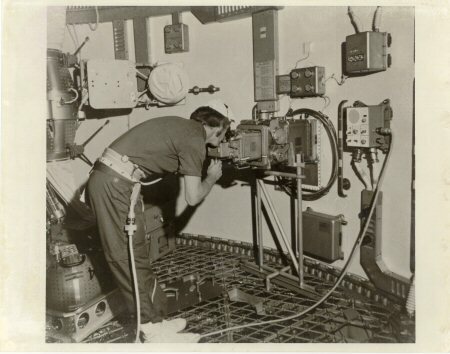 A Martin Marietta engineer checks the earth resources viewfinder / tracker systems in the Multiple Docking Adapter training unit. 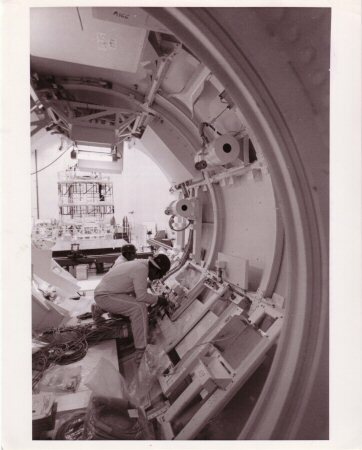 A technician installs wiring in the mock-up of the Multiple docking Adapter. 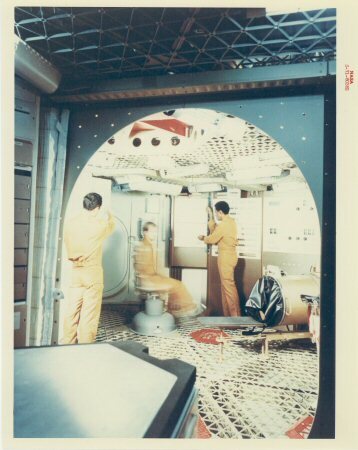 A fine picture of the experiment area of the crew quarters as seen through the doorway of the wardroom. The crewman is demonstrating the operation of the M131 Rotating Chair Experiment called the Human Vestibular Function using the litter chair. Evaluations will be performed to determine the angular accelerator comfort zone and to identify vestibular changes that may occur during space flight. The other crewmen are operating the controls and instrumentation for the experiment. 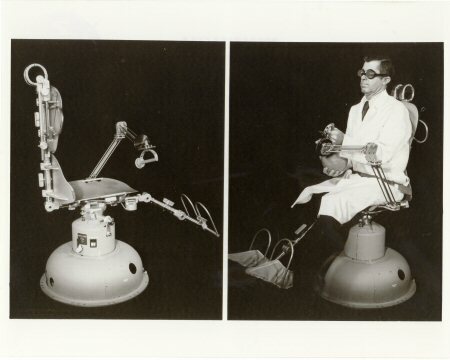 The M131 Rotating Chair Experiment called the Human Vestibular Function using the litter chair. Evaluations will be performed to determine the angular accelerator comfort zone and to identify vestibular changes that may occur during space flight. Detailed information on this chair and the experiment is given on the back of the photo. Technicians in the wardroom of the Orbital Workshop preparing food. 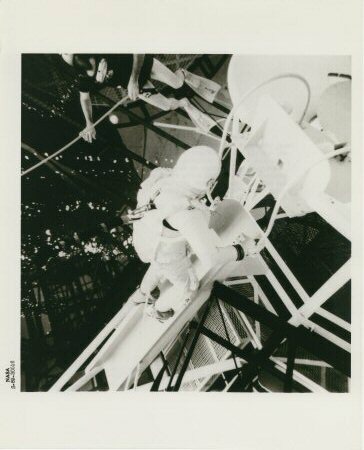 Note the technicians are using the foot restraints that would keep them from floating away while in zero gravity. 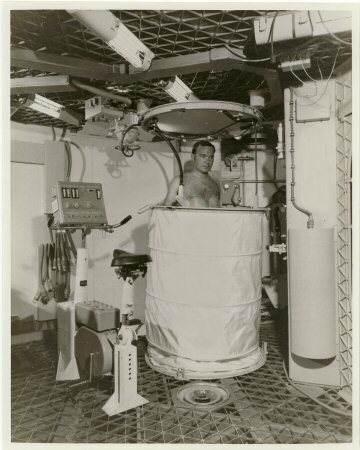 Crewman in the waste management compartment of the crew quarters demonstrating the use of the water dispenser for personal hygiene. 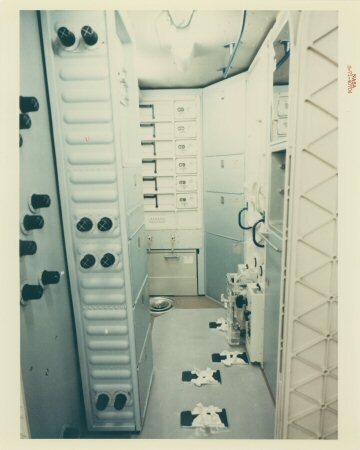 Sleep compartment of crew quarters of the Hi Fidelity mock-up at McDonnell Douglas in Huntington Beach, California. 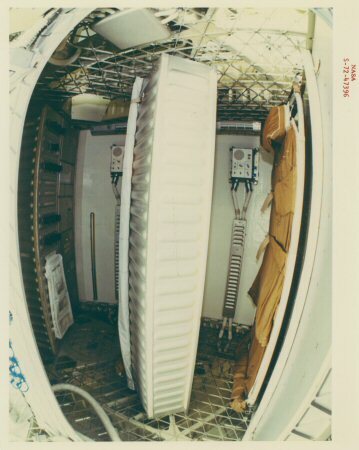 Waste management compartment of crew quarters of the Hi Fidelity Orbital Workshop mock-up. A nice view looking up inside the Orbital Workshop Training Unit as the crew members position a portable fan. 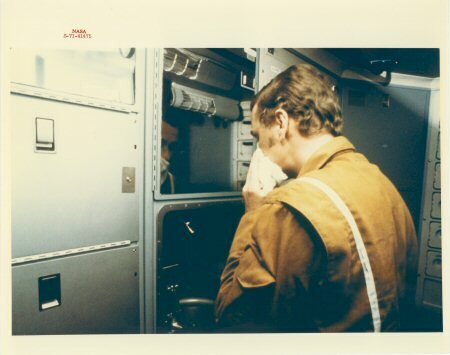 Crewman shaving in the head in the crew quarters area of the Orbital Workshop. 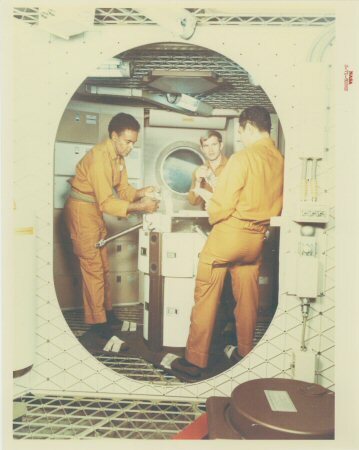 Three test engineers, a simulated flight crew, prepare a meal in the wardroom section of the Skylab Workshop mock-up. 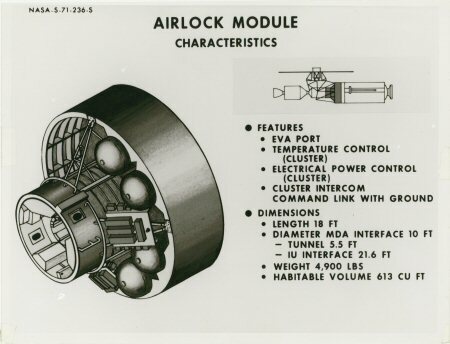 Main characteristics of Skylab's Airlock Module. 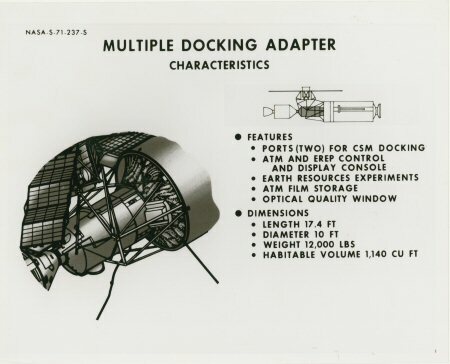 Main characteristics of Skylab's Multiple Docking Adapter Module. A wonderful view of Skylab's Airlock Module at Marshall Space Flight Centre in Huntsville, Alabama. If purchased with the above photo. 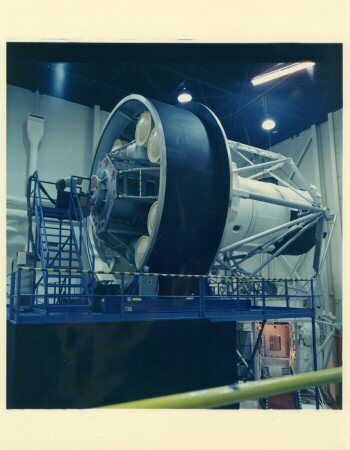 Another view of Skylab's Airlock Module at Marshall Space Flight Centre in Huntsville, Alabama. This photograph was released 27 March 1979 in respect of the Skylab Space Station re-entry into Earth's atmosphere. The Airlock Module is noted to survive the re-entry back to earth. 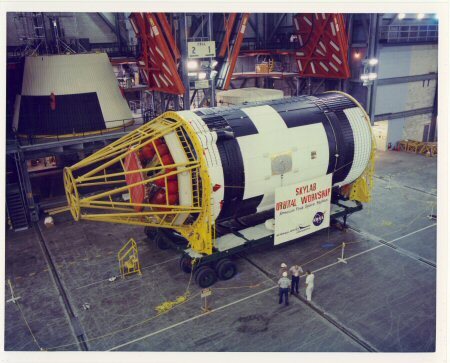 Skylab's Airlock Module as seen in 1973 during pre-launch preparations. This very fine vintage glossy NASA photograph is in very good condition. Would be in mint condition but it has a small tear in the right hand border that has been repaired with photo grade tape. 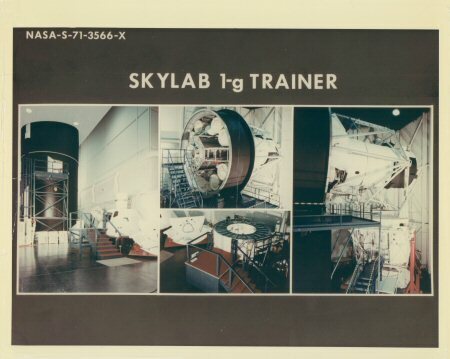 The Skylab Multiple Docking Adapter (MDA) Flight Article as seen at Marshall Space Flight Centre in Huntsville, Alabama. 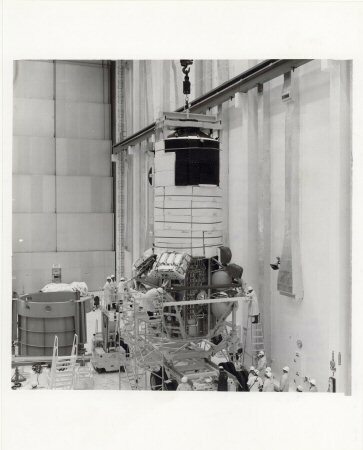 The Skylab MDA Flight Article is being positioned on a test stand for checkout at Martin Marietta Corp in Denver, Co. before shipment and mating to the airlock module at the McDonnell Douglas Plant in St Louis, Mo. 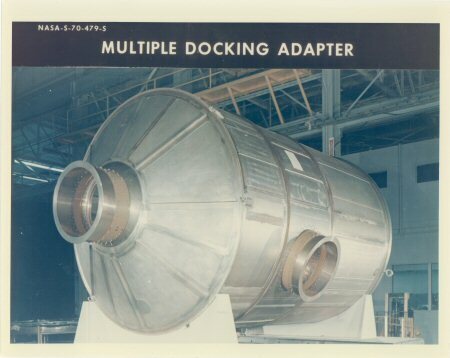 The Multiple Docking Adapter is one of the five major segments of Skylab. 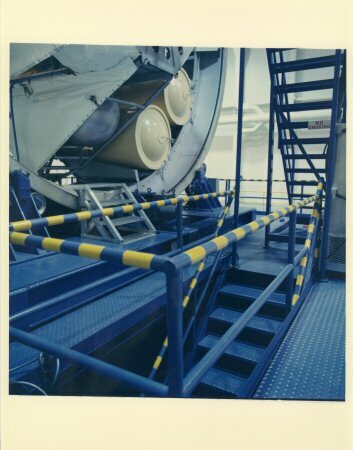 This section will provide facilities for docking the Command Module and provide a working area for various experiments. The Skylab MDA Flight Article is being positioned on a test stand for checkout at Martin Marietta Corp in Denver, Co. 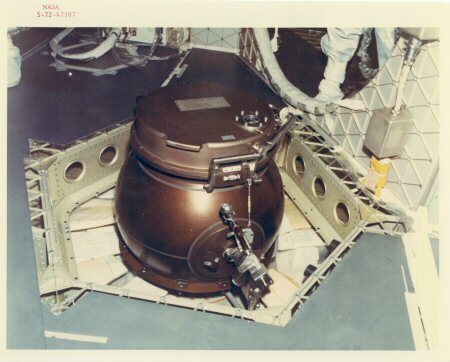 The Multiple Docking Adapter is one of the five major segments of Skylab. 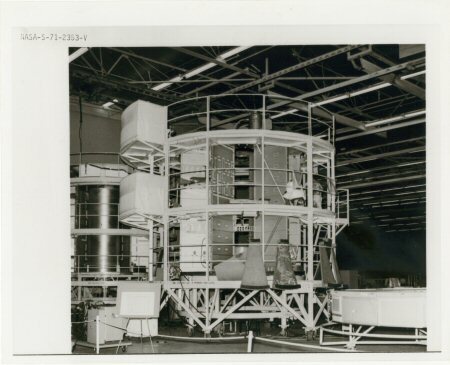 This section will provide facilities for docking the Command Module and provide a working area for various experiments. 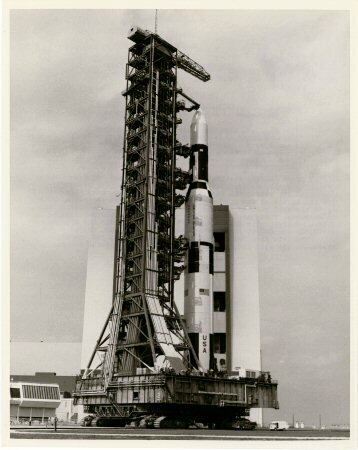 The Skylab Multiple Docking Adapter is suspended from a crane during test at at Martin Marietta Corp Space Division in Denver, Co. Its next stop will be at McDonnell Douglas Plant in St Louis, Mo. for mating to the Airlock Module. 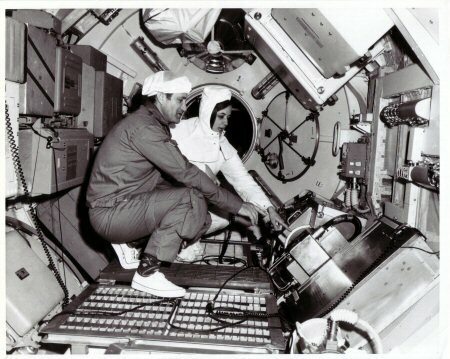 Engineer Stephanie Smith outlines equipment locations for astronaut William Pogue during the NASA acceptance checkout of the Skylab Multiple Docking Adapter Flight Article. 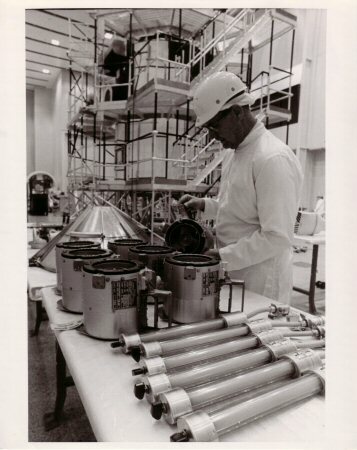 A test engineer examines flight Articles for the Skylab Docking Adapter as seen in the background in its test stand. 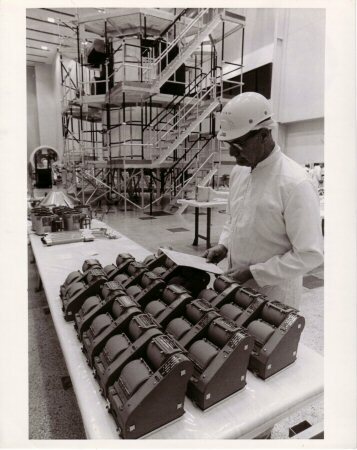 A test engineer examines the film magazines that will be carried onboard Skylab. The Multiple Docking Adapter is seen in a test stand in the background. 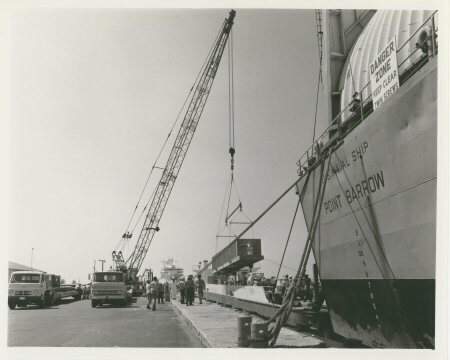 Skylab's Airlock Module/Multiple Docking Adapter (AM/MDA) is off-loaded at the Cape's Skid Strip prior to being transported to KSC's Manned Spacecraft Operations Building. The AM serves as a 'pressurized passageway between the MDA and the Workshop. 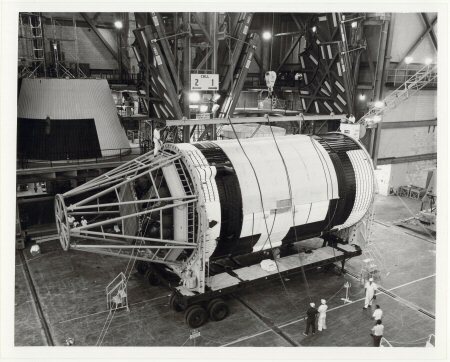 Skylab's Airlock Module/Multiple Docking Adapter (AM/MDA) undergoes receiving inspection on its transporter following its arrival at the Cape. 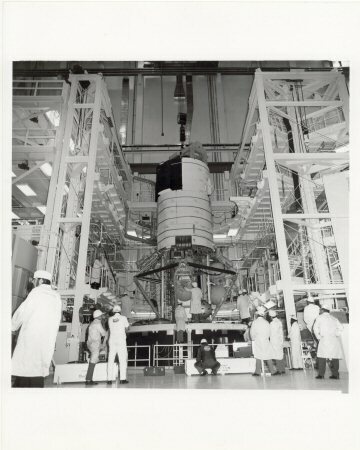 Receiving inspection is the first of a series of checks and tests performed in the Manned Spacecraft Operations Building prior to transfer of the AM/MDA to the Vehicle Assembly Building for mating with the Skylab Orbital Space Station. The Airlock Module serves as a 'pressurized passageway between the Multiple Docking Adap and the Workshop. 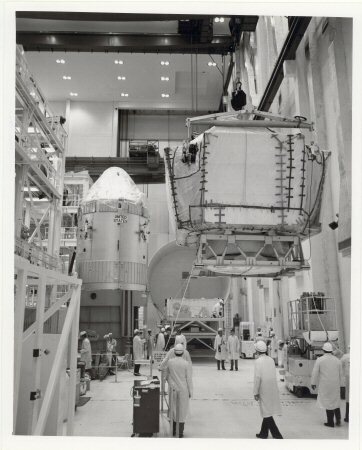 Skylab's Multiple Docking Adapter (MDA), pictured above the Airlock Module (AM), is moved by crane into the Integrated Work Stand in the Manned Spacecraft Operations Building following receiving inspection. 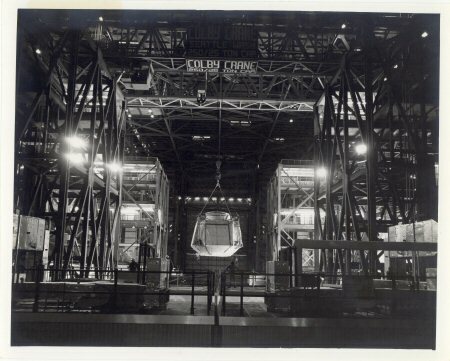 It begins a flow of checkouts prior to mating with other Skylab sections at the Vehicle Assembly Building. 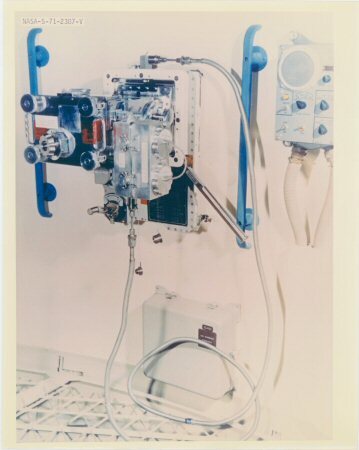 The Multiple Docking Adapter provides docking facilities for the Apollo Spacecraft with the Orbital Workshop and the Airlock Module serves as a pressurized passageway between the MDA and the Workshop. 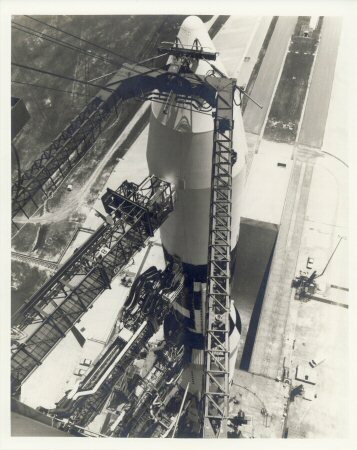 Skylab's Airlock Module / Multiple Docking Adapter is being hoisted up into High Bay 2 for mating with the 2 stage Saturn V launch vehicle in the Vehicle Assembly Building. A outstanding overall view looking down into the Orbital Workshop. 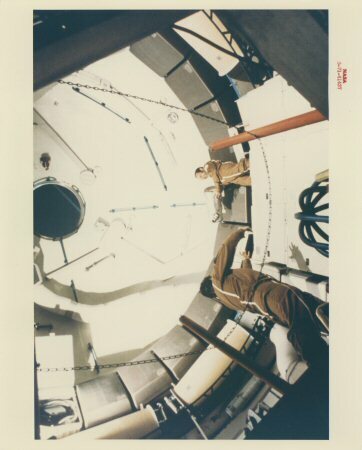 This very fine vintage colour glossy NASA photograph is in mint condition. Printed on heavy "A Kodak Paper". Wide-angle view inside the Orbital Workshop's sleep compartments. 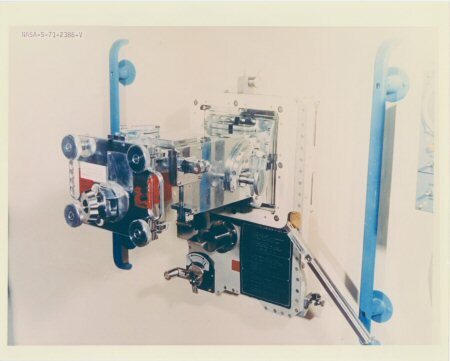 This flight unit made by the McDonnell Douglas Astronautics Corp., designed by NASA's Marshall Space Flight Centre, is a shower assembly which will be stored as a compact unit in the Orbital Workshop's crew quarters. Each astronaut can bathe weekly with liquid soap, warm water and use bath cloths. Complete design and use details are given on the on the back of the photo. View of the airlock of the waste disposal located in the crew quarters area of the Orbital Workshop (OWS). 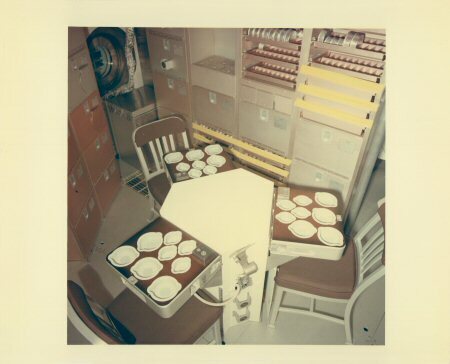 Looking inside the Skylab's Wardroom is the table that the astronauts will take there meals. 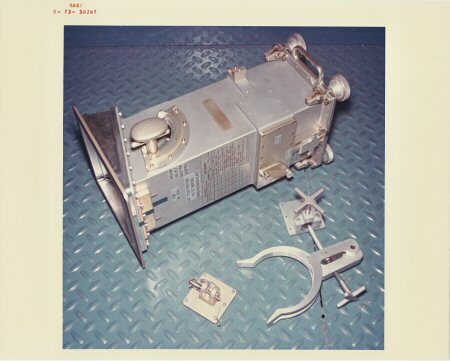 Located in the wardroom of the Orbital Workshop we see the foot restraints that are necessary to keep crewman from floating away while in zero gravity. This very fine vintage colour NASA photograph is in near mint condition. The Solar Array System which will provide electrical power for the Orbital Workshop was off-loaded at Port Canaveral today and moved to the Manned Spacecraft Operations Building at the Cape for check-out. The Array System panels are 31 feet long and 27 feet wide and two will be used. The 1,200 square feet of solar cells will provide 10.5 kilowatts for equipment loads and battery charging for the orbiting cluster. 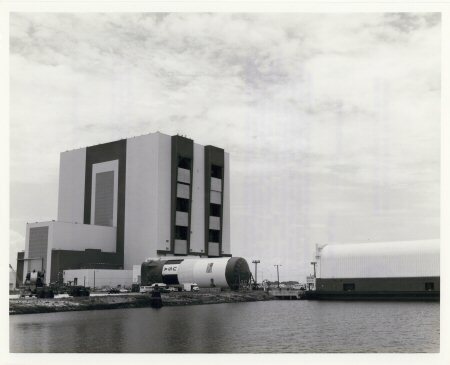 The Skylab Orbital Workshop was moved into the VAB on September 23rd, 1972 and is now being prepared for mating with its Saturn V launch vehicle on 29th of September. 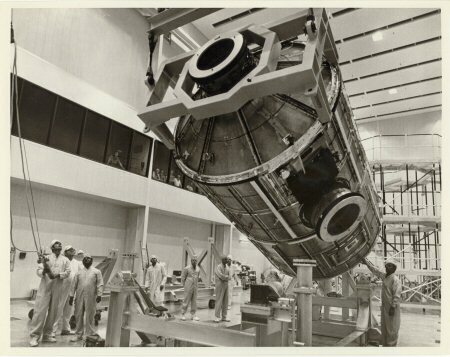 The Orbital Workshop is a modified Saturn V third stage in which three 3-man crews will live and work for up to 56 days during the 1973 Skylab missions. 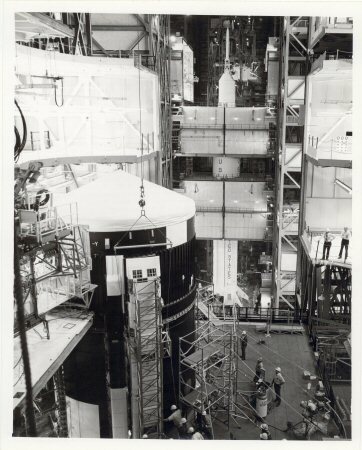 KSC workers can be seen discussing the upcoming move of Skylab's Orbital Workshop to High Bay 2 in the Vehicle Assembly Building. There it will be mated with the SII Stage of the Saturn Launch Vehicle. This very fine reissued NASA colour glossy photograph is in near mint condition with the black logo and text on the back. 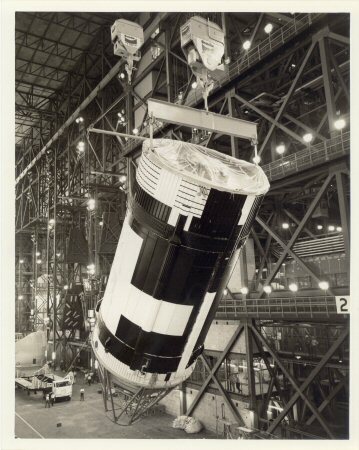 The Skylab Clusters Orbital Workshop is being prepared to be hoisted up to High Bay 2 in the Vehicle Assembly Building for mating with the SII Stage of its Saturn V launch vehicle. 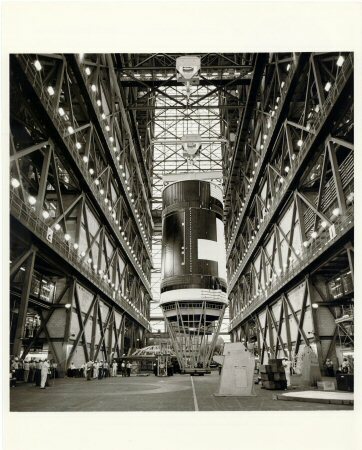 A fantastic view in the High Bay 2 Area of the VAB as the Skylab Orbital Workshop is in preparation for mating with the SII Stage of its Saturn V launch vehicle. A very clear and crisp photo as the detail is fine vintage shot is outstanding. In High Bay 2 of the VAB the Skylab Orbital Workshop is being hoisted up for mating with the SII Stage of its Saturn V launch vehicle. 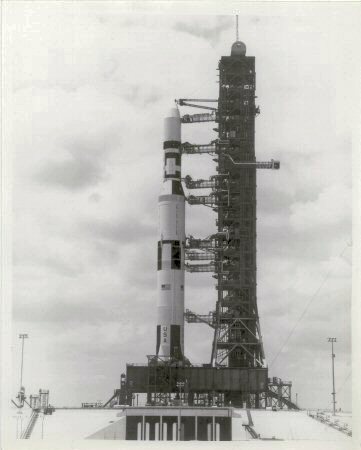 In High Bay 2 Skylab 1 is seen with the Orbital Space Station atop its Saturn V launch vehicle. 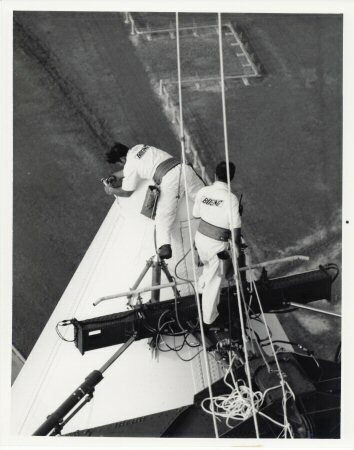 VAB staff are seen installing solar cell arrays to the Space Station. 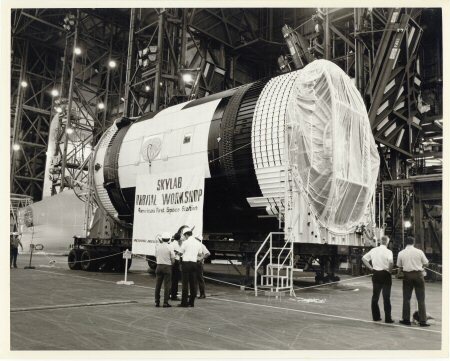 Ready for Roll Out, Skylab 2 is seen in the background in High Bay 1. 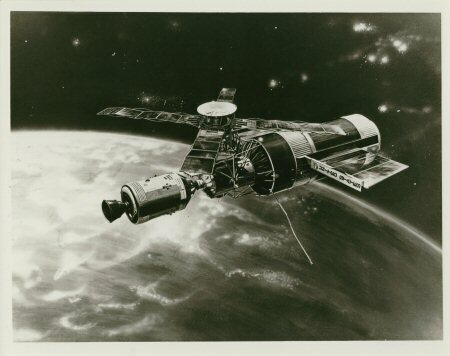 This fine vintage glossy NASA photograph is in mint condition. 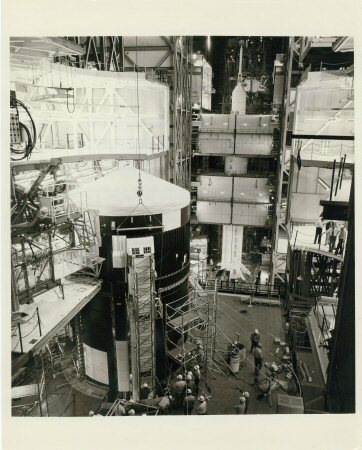 The Skylab Orbital Workshop is shown mated atop its Saturn V launch vehicle in High Bay 2 of the VAB at the Cape. 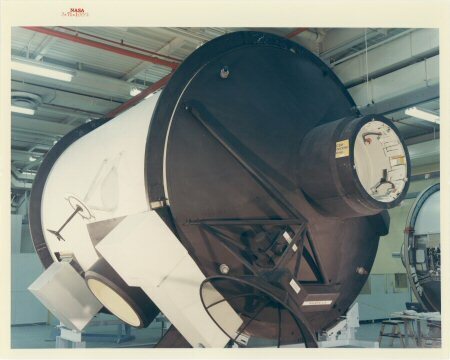 The Apollo Telescope Mount (ATM), designed and developed by the Marshall Space Flight Center, was one of four major components comprising the Skylab Cluster (1973-1979). The ATM housed the first manned scientific telescope in space. 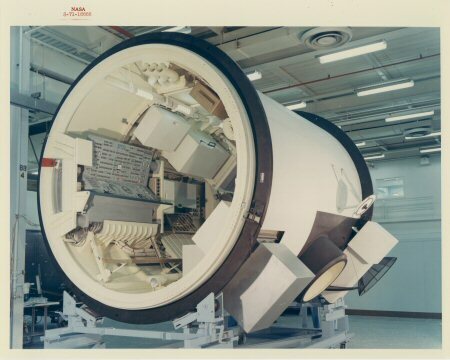 This photograph is of the ATM thermal systems unit undergoing testing in the Space Environment Simulation Laboratory of the Manned Spacecraft Center. 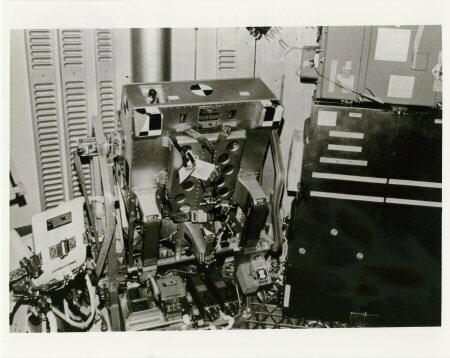 The ATM thermal systems unit was used to control the temperatures of space instrument's subsystems during a mission. The ATM's rack is the outer octagonal complex frame that houses the ATM flight unit. 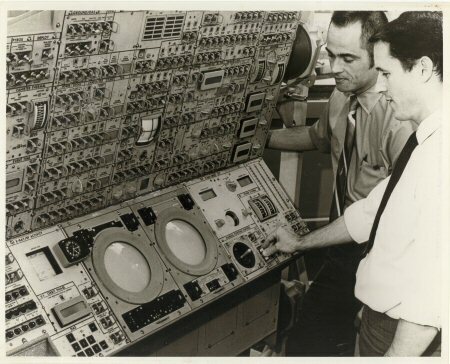 Astronauts Robert L. Crippen (left) and Edward G. Gibson review operation of the Control and Display Console for Skylab's Apollo Telescope Mount (ATM) Solar Observatory. 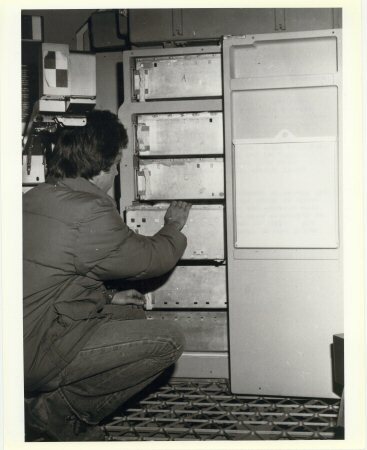 The Control and Display Console for Skylab's Apollo Telescope Mount (ATM) Solar Observatory installed in the Orbital Workshop. 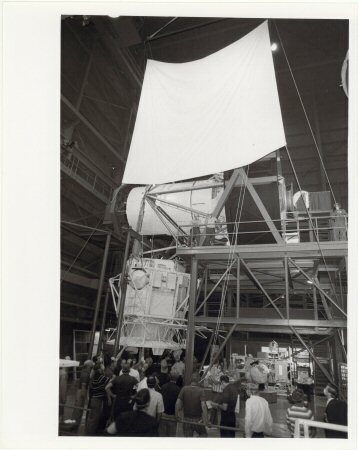 The Apollo Telescope Mount (ATM) for the Skylab Orbital Workshop was flown into the Cape's Skid Strip today and was moved into the Manned Spacecraft Operations Building for checkout. 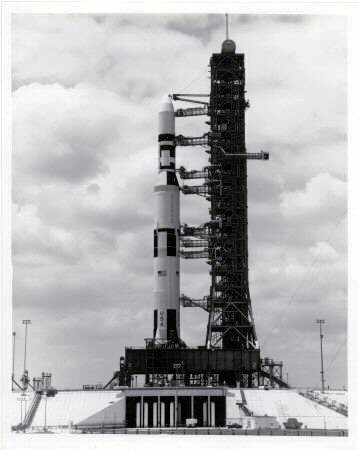 Its scheduled for mating with the Skylab Saturn V in January 1973. 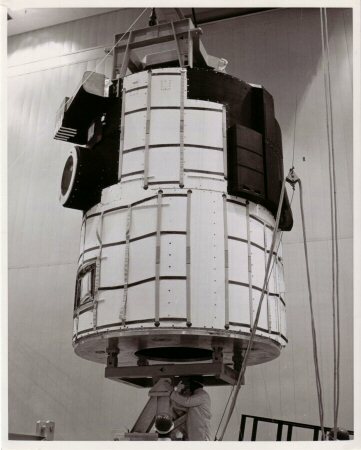 The Apollo Telescope Mount (ATM) is shown after arrival in the Manned Spacecraft Operations Building for checkout and systems test. 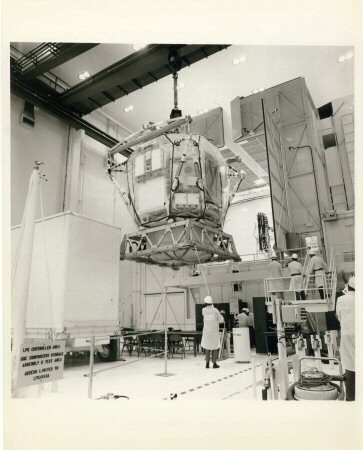 A overhead view of the Apollo Telescope Mount (ATM) after its arrival in the Manned Spacecraft Operations Building for checkout and systems test. 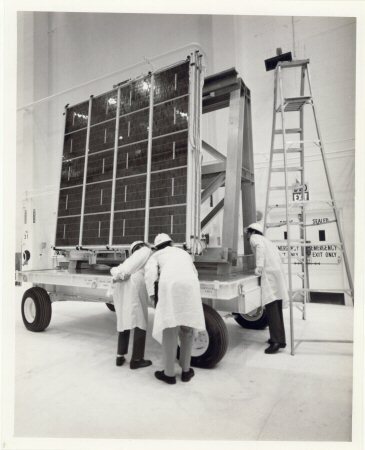 The solar panels which will supply electrical power for the Apollo Telescope Mount to be flown aboard the Skylab Cluster is inspected in the Manned Operations Building prior to installation on the ATM on this day in 1973. 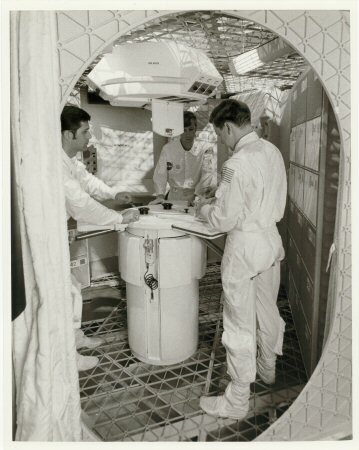 The exterior of Skylab's Apollo Telescope Mount is checked in the White Room at the Cape by Tony O'Neil (left) and Hobbie Short. 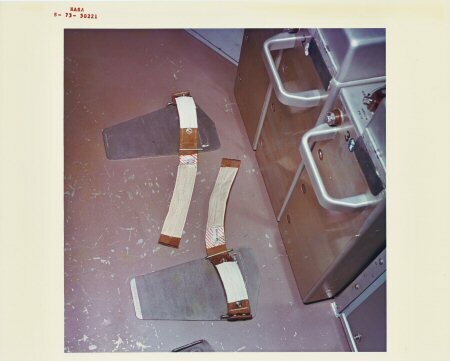 O'Neil's hand rests on foot restraints while Short checks handrail which will be used by Skylab astronauts working in space outside the Orbital Workshop. 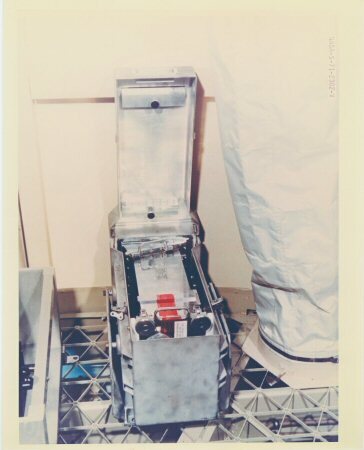 Exterior view of Skylab's Apollo Telescope Mount showing the foot restraints and hand rails that Skylab astronauts will use during EVA while in Earth Orbit. 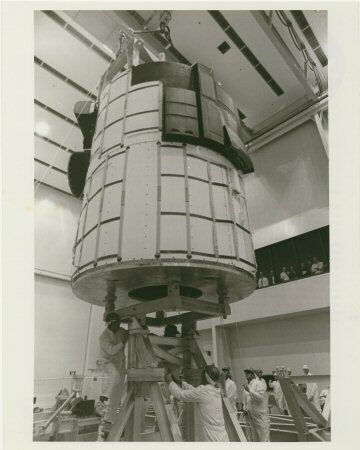 The Apollo Telescope Mount for the Skylab orbital workshop is being moved from the 'Clean Room' in the Manned Spacecraft Operations Building to the Vehicle Assembly Building for mating with the other components of the Skylab Orbital Cluster. The Skylab 2 Spacecraft that will carry the first manned crew to the orbiting cluster is seen in the background on the left. A wonderful view atop High Bay 2 with the Apollo Telescope Mount for the Skylab orbital workshop. 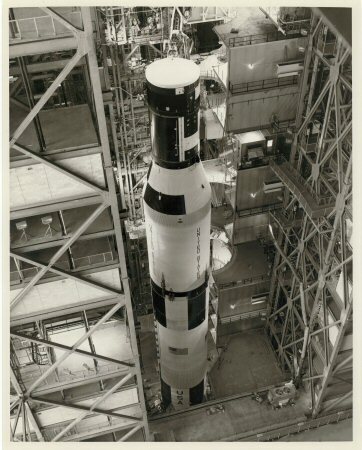 It was mated with its two-stage Saturn V launch vehicle and other components of the orbital cluster today in High Bay 2 in the Vehicle Assembly Building at the Cape. 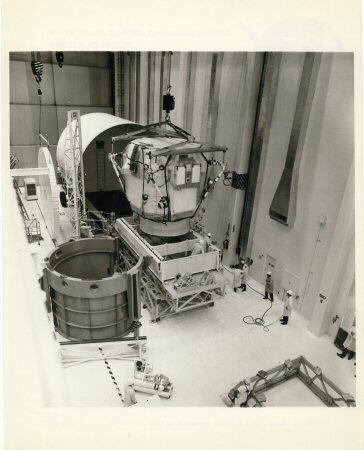 The Apollo Telescope Mount for the Skylab orbital workshop was mated with its two-stage Saturn V launch vehicle and other components of the orbital cluster in High Bay 2 in the Vehicle Assembly Building at the Cape. A fine overhead view of NASA's Mobile Laboratories for the extensive experiments that come from the Earth orbiting Skylab Laboratory. 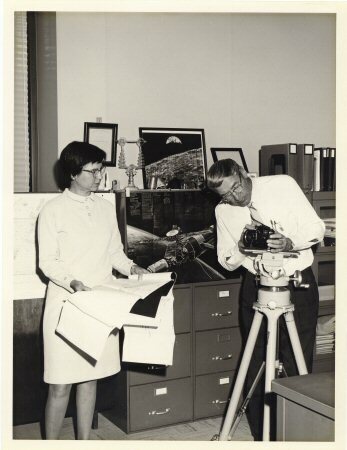 A family affair as Dr. Donald M. Packer and his wife Mrs. Irene G. Packer check over some Skylab data and camera equipment in their office at the Naval Research Laboratory in Washington, D.C. This very fine vintage glossy NRL photograph is in very good condition. 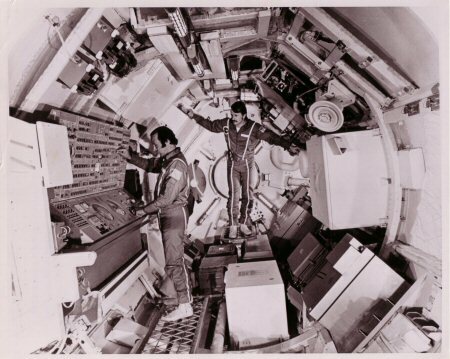 Astronaut Gerry Carr is seen with the latest Man Manoeuvring Unit (MMU) for the M509 Experiment during fit checks. 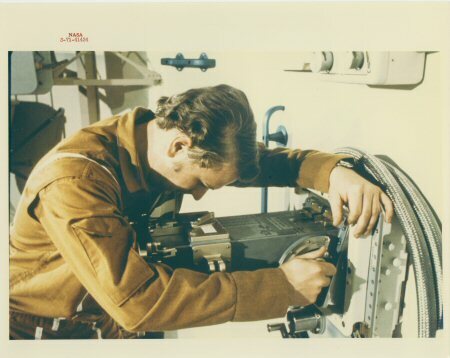 Close up view of the MMU for the M509 Experiment as worn by Astronaut Gerry Carr during fit checks. The unit will be tested within Skylab's Orbital Workshop while in Earth orbit. 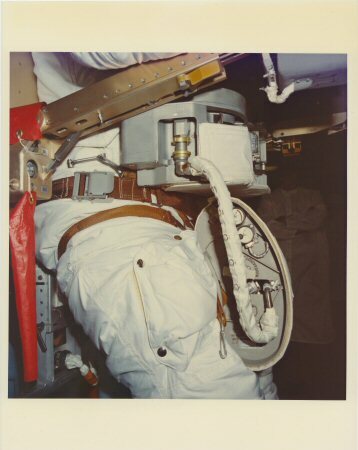 Astronaut Maneuvering Unit M509 Experiment in a stowed configuration. Crewman using the camera for the S020 Solar Photography Experiment. Flight Unit S020 X-Ray/UV Solar Camera. Note the hand rails for use in zero gravity. The camera used for the S020 Solar Photography Experiment. A special airlock in the wall of the workshop allows the crew to perform several ' outside ' experiments. Here, a camera equipped with calcium fluoride transmission optics to pass ultra-violet light is aimed at stars in the Milky Way field. This photograph was released 27 March 1979 in respect of the Skylab Space Station re-entry into Earth's atmosphere. 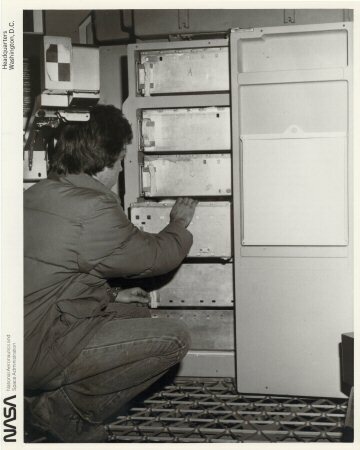 Workman inspects the film vault on the Skylab Workshop. 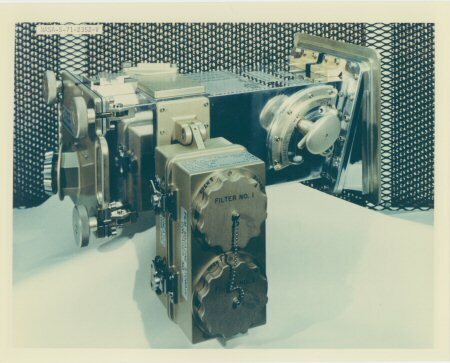 The vault was designed to protect photographic film from radiation is space. The vault weighs about 4,000 pounds and is lead lined. Experiment S193, Microwave, Radiometer, Scatterometer and Altimeter flight article. 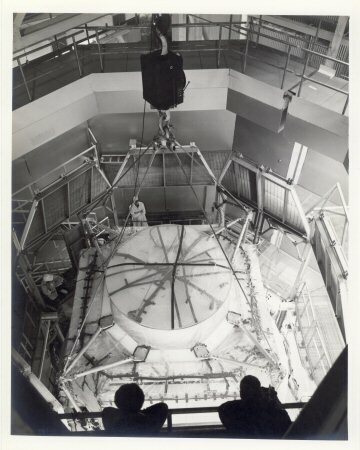 This 24,000-pound nose cone will be split explosively into four panels and caught by nets during tests in a huge vacuum chamber at the Plum Brook Station of NASA's Lewis Research Centre. Separation of the 56 foot tall, 22 foot wide shroud will take less than one second. 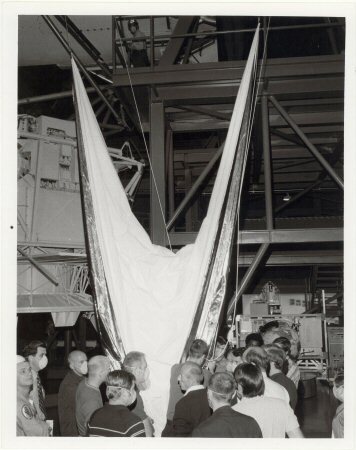 This shroud will cover the Apollo Telescope Mount, Docking Adaptor and part of the Airlock on lift off of the Saturn V noted as Skylab 1 to deploy the space station cluster in earth orbit. The enshrouded Skylab Orbital Workshop and related hardware dominates this fantastic view, which includes part of the Skylab 1 Saturn V and mobile launcher ground support equipment. The swing arms at left provide personnel access to various sections of the space vehicle: the damper arm is the foreground provides additional support when the Mobile Service Structure is not in place around the space vehicle. 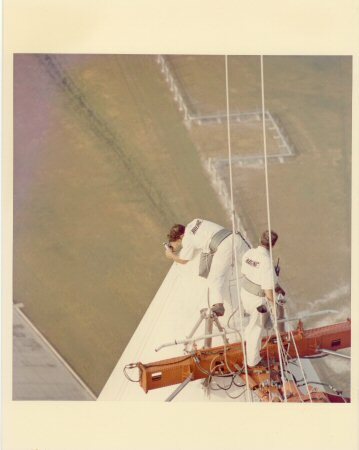 A view that almost takes your breath away of two Boeing technicians working on top of the Saturn V space stations Shroud. Well over 350 feet above Pad A of Launch Complex 39 at the Cape. This outstanding view was photographed from the Mobile Launcher's LUT. 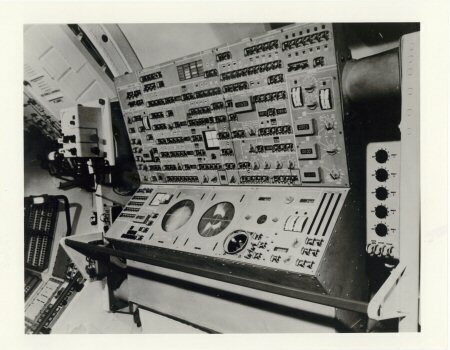 One of the few NASA black and white photographs printed on 'A Kodak Paper'. 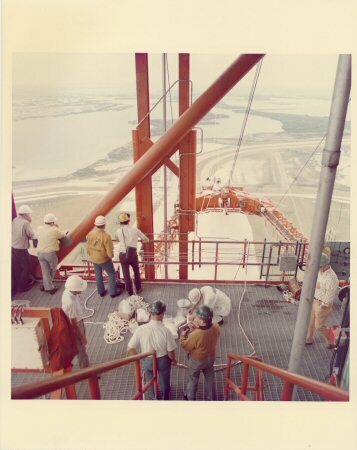 A view that almost takes your breath away high above the Cape on top of the Mobile Service Structure at LC39A as KSC workers watch two Boeing technicians on top of the Saturn V space stations Shroud. 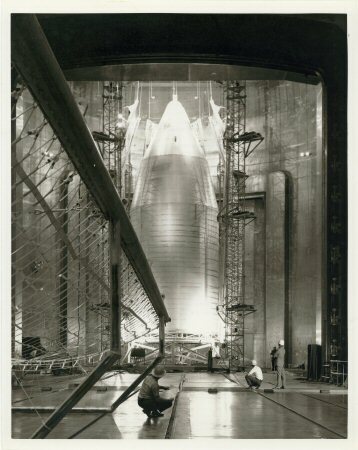 Well over 350 feet above Pad A of Launch Complex 39 at the Cape the Boeing technicians make the last checkout of the Nose Cone before lift off. 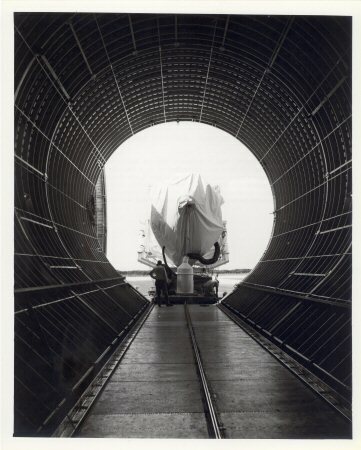 Following a six-day barge trip from the NASA Michoud Assembly Facility at New Orleans, the booster stage for the Saturn V rocket that will launch Skylab experimental space laboratory, was off-loaded today at KSC. 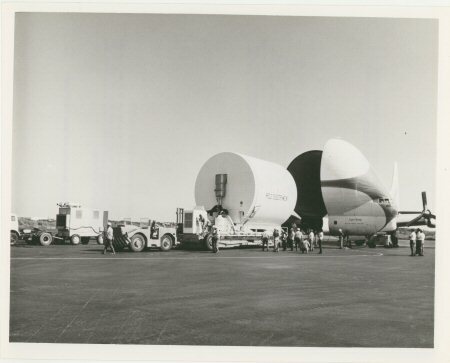 Following a six-day barge trip from the NASA Michoud Assembly Facility at New Orleans, the booster first stage for the Saturn V rocket that will launch Skylab experimental space laboratory, was off-loaded today at KSC. 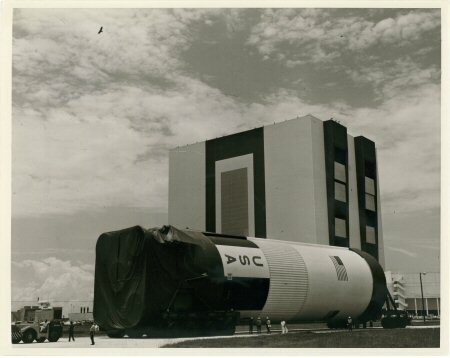 The 341-feet tall Skylab 1/Saturn V space vehicle has just left the Vehicle Assembly Building on its way to Launch Complex 39A. 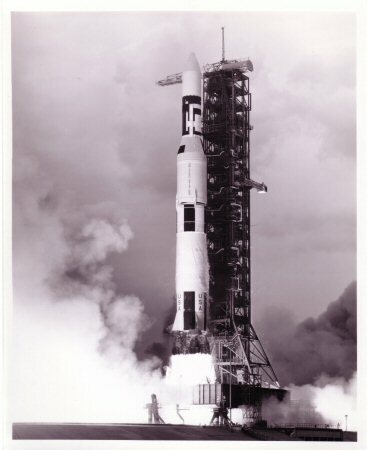 The vehicle is composed of the Saturn V first & second stages, the Apollo Telescope Mount (ATM), the Multiple Docking Adapter (MDA), the Airlock Module (AM), and the Orbital Workshop (OWS). 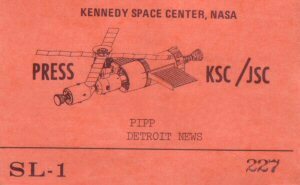 The Skylab space station has been nick-named The Cluster as it is made up of these various components. 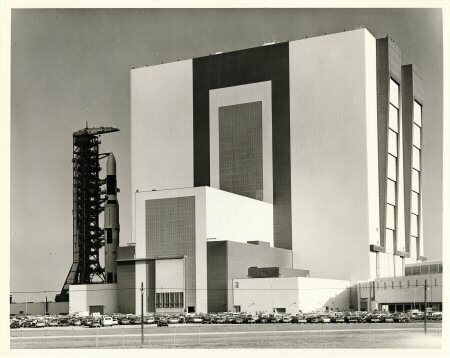 A fine view of the 341-feet tall Skylab 1/Saturn V space vehicle with the Vehicle Assembly Building in the background. 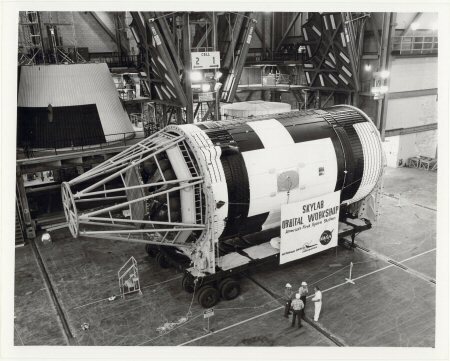 The vehicle is composed of the Saturn V first (S-1C) stage, the Apollo Telescope Mount (ATM), the Multiple Docking Adapter (MDA), the Airlock Module (AM), and the Orbital Workshop (OWS). 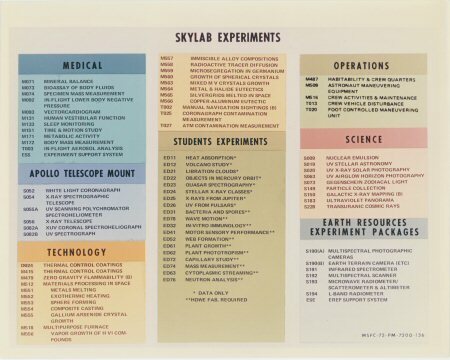 The Skylab space station has been nick-named The Cluster as it is made up of these various components. A fine view through the palm trees of the 341-feet tall Skylab 1/Saturn V space vehicle soon after leaving the Vehicle Assembly Building. 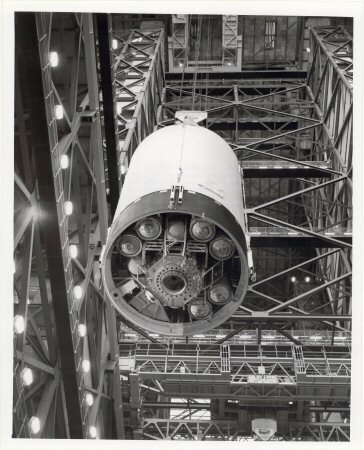 This wonderful view of Skylab 1's launch vehicle was take through the protective camera housing located in a fixed position at Launch Complex 39's Pad A. This is where the Saturn V will launched the Skylab space station into Earth orbit. 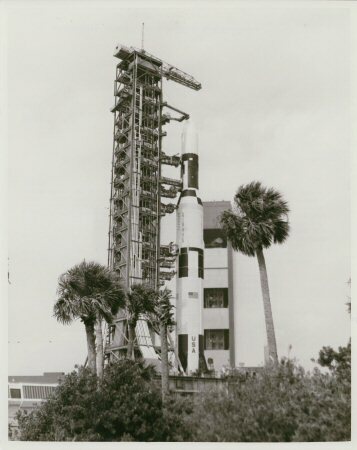 A ground-level view of Pad A, Launch Complex 39, Kennedy Space Center, Florida, showing the 341-feet tall Skylab 1/Saturn V space vehicle on the pad soon after being rolled out from the Vehicle Assembly Building (VAB). 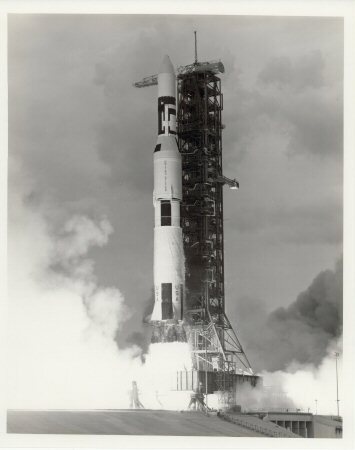 The vehicle is composed of the Saturn V first (S-1C) stage, the Apollo Telescope Mount (ATM), the Multiple Docking Adapter (MDA), the Airlock Module (AM), and the Orbital Workshop (OWS). 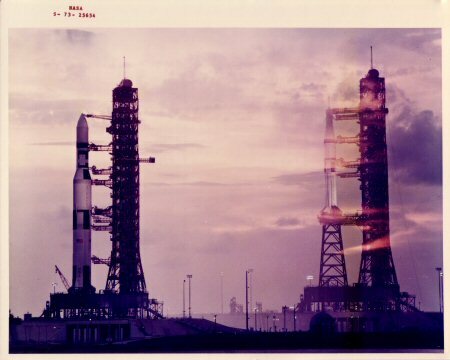 A deliberate double exposure to help illustrate the comparative sizes and configurations of the Skylab 1 and Skylab 2 space vehicles at Launch Complex 39, Kennedy Space Centre, Florida. The double exposure creates an illusion that the rockets are side by side, though actually they are 1 1/2 miles apart. 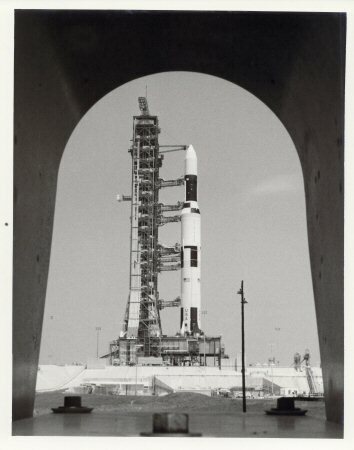 The Skylab 1/Saturn 1B space vehicle is on Pad A of Complex 39 (left). On the right is the Skylab 2/Saturn 1B space vehicle on Pad B. 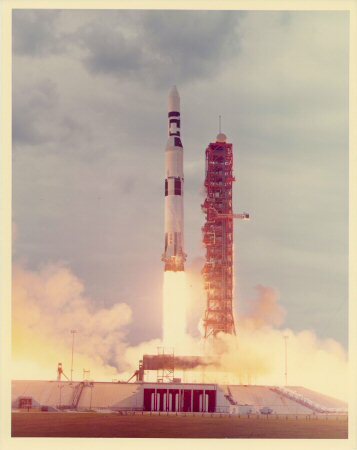 The unmanned Skylab 1/Saturn V space vehicle is launched from Pad A, Launch Complex 39, Kennedy Space Center, Florida, at 1:30 EDT, May 14, 1973, to place the Skylab space station cluster in Earth orbit. Skylab 1 Lift-Off to deploy the Skylab Space Station. 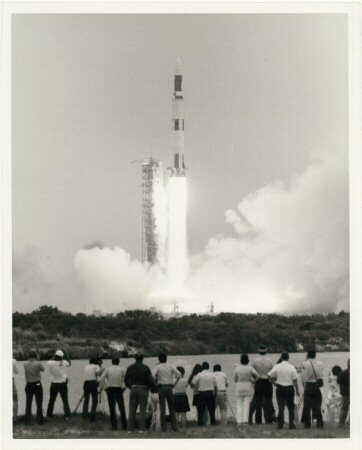 America's first space station launched into Earth orbit. 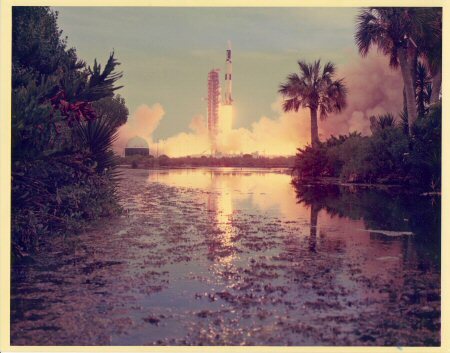 This fine vintage NASA photographs is in near mint condition. 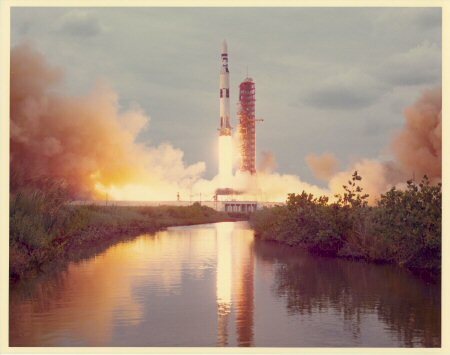 A wide angle view of Skylab 1 Lift-Off to deploy the Skylab Space Station. 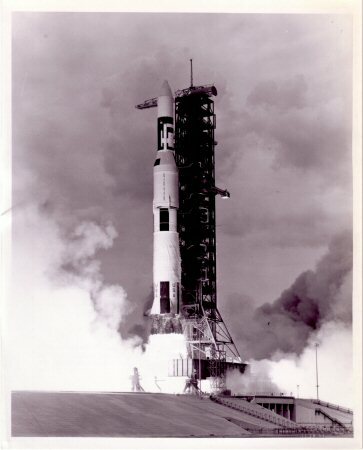 America's first space station launched into Earth orbit. This fine vintage colour NASA photograph is in near mint condition. Apollo 17 astronaut Eugene Cernan appears to be helping the modified Saturn V carrying the Skylab Orbital Workshop lift off from Launch Complex 39A. 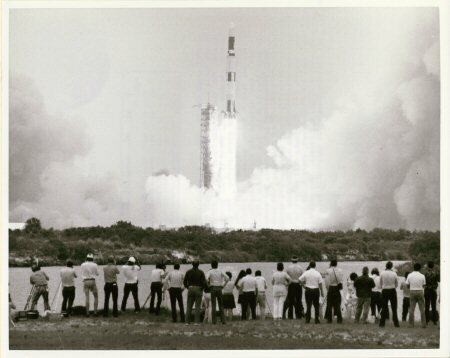 Cernan described highlights of the fiery lift-off, viewed from a site about 3.5 miles from the launch pad, to former pisoners of war Air Force Major Bill Elander, with his 2 year old son, Ben, (sitting on his lap), and Air Force Major Tim Ayres (on Cernan's left). 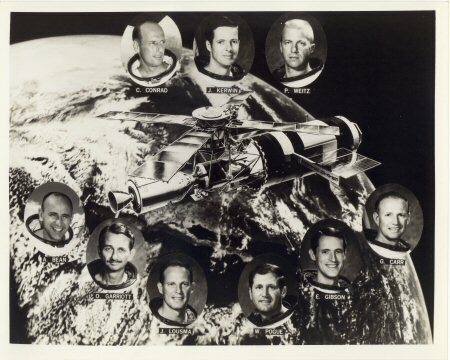 They were among 27 former POW's who attended the launch as NASA's guests. 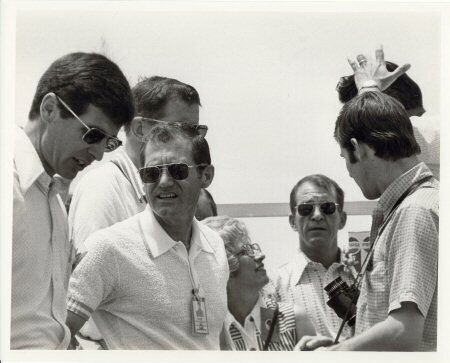 During Skylab 1 pre-launch activities at the viewing site, 1.5 miles from Launch Pad A, Apollo 8 astronaut William Anders, left, chats with Skylab 4 Pilot Bill Pogue. Looking on at right is Bob Johnson, son of recently released POW Air Force Col S. Johnson, one of 27 former prisoners who were NASA's guest at the lauch. 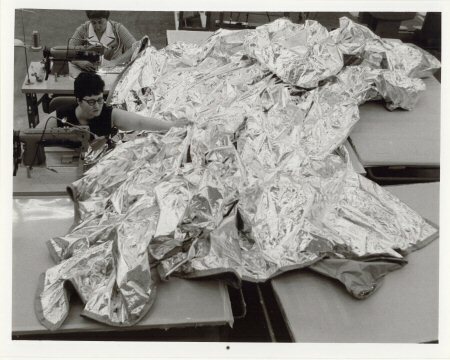 Two ILC Industries employese, Mrs Delores Zerolcs, Foreground, and Mrs Ceal Webt, sew a solar shield from a nylon-base material which is being considered for the Skylab Space Station Sun Shade. 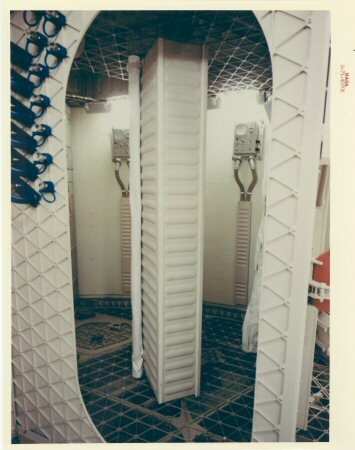 This sun shade, known as the A-Frame or Twin-Pole Arrangement, was designed at the Marshall Space Flight Center. 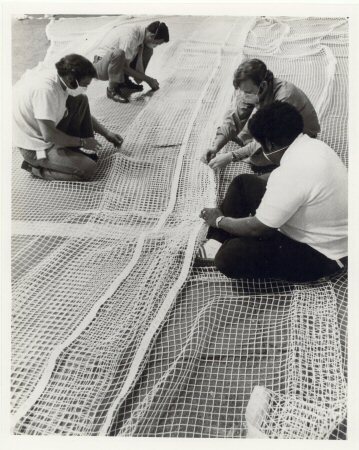 Workmen at NASA's Marshell Space Flight Center fold a piece of nylon netting which, in underwater test, simulates the aluminized material proposed for use as a solar shield for the Skylab Space Station. This nylon netting was chosen for its ease of use in underwater simulations exercises. A beautiful shot of Story Musgrave and Rusty Schweickart as they set up the nylon netting simulating the solar shield being considered for use on the orbiting Skylab Space Station in the Neutral Buoyancy Simulator water tank at MSFC. Story is seen in the centre with Schweickart on his left and there are plenty of Safety Divers on hand if needed. 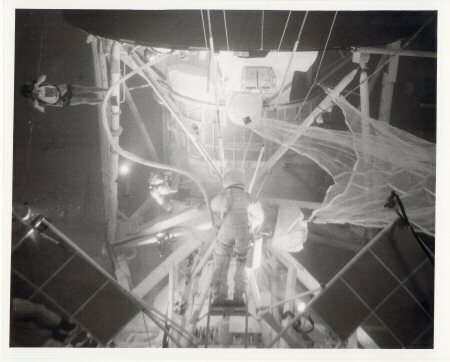 This sequential underwater view depicts Story Musgrave and Russell Schweickart during the deployment stages of a nylon netting simulating the solar shield being considered for use on the orbiting Skylab Space Station. Skylab 2 prime and backup astronauts were among personnel who watched one of the proposed sun shade methods to cool the orbiting Skylab Space Station lifted into place during training exercise at the Marshall Space Flight Center. 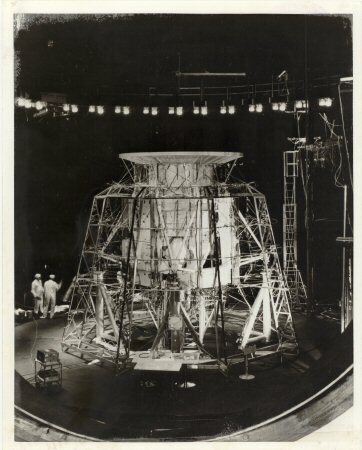 The Skylab Cluster's primary elements, The Workshop, Airlock and Multiple Docking Adapter Mock-ups, are used in this full scale demonstration. Skylab 2 prime and backup astronauts were among personnel who watched one of the proposed sun shade methods to cool the orbiting Skylab Space Station lifted into place during training exercise at the Marshall Space Flight Center. 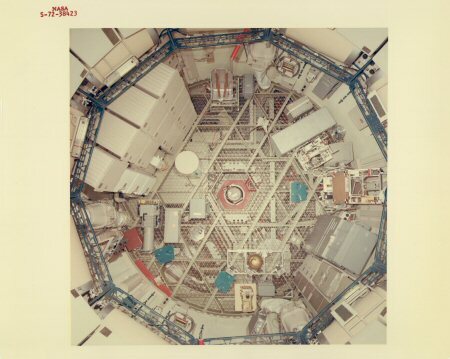 The Skylab Cluster's primary elements, The Workshop, Airlock and Multiple Docking Adapter Mock-ups, are seen in this full scale demonstration. 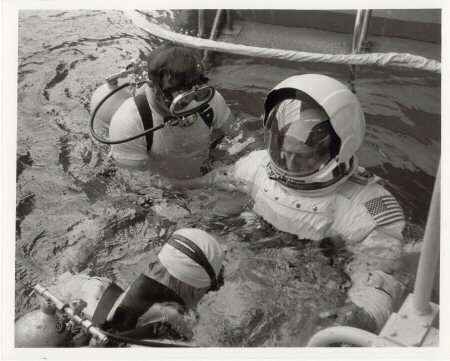 Skylab 2 Commander Pete Conrad is assisted by Divers in MSFC's Neutral Buoyancy Simulator at the start of A-Frame or Twin-pole sun shade deployment exercise in the huge water tank. 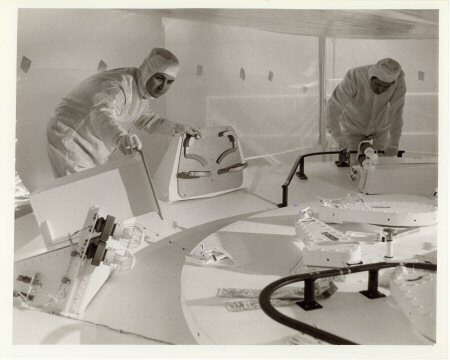 Rockwell International technicians removed portions of the crew couches in the Skylab 2 Command Module to create stowage room for the solar shields which the crew will carry up to the Skylab Orbital Workshop. The two solar shields are now undergoing tests at the Marshall Space Flight Center in Huntsville. 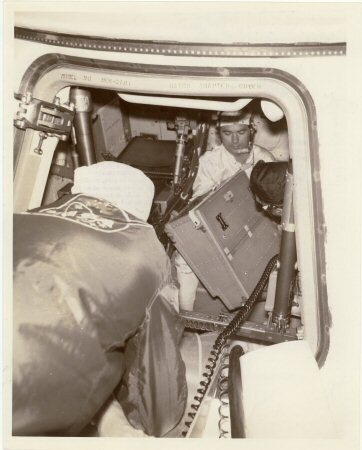 Also removed from the Command Module was the in-flight medical kit. 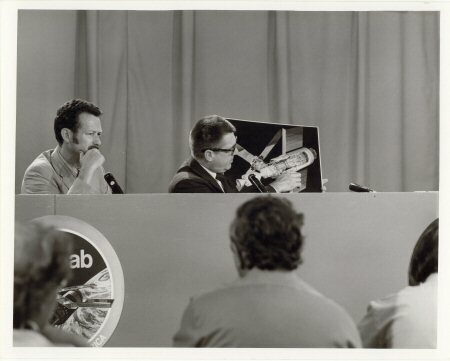 Two NASA employees update the press on Skylab's Solar Shield situation. 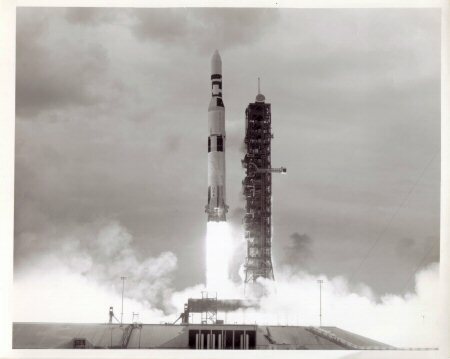 Thank you for viewing - I will be adding more Vintage Skylab Photographs soon.